In my previous estimate of the iPad Mini's BOM, I had done a rough calculation of the device's cost structure based on the BOM of the iPad & the Kindle Fire. Now that we also have the Nexus 7's BOM, we can try and get a more accurate picture of the iPad Mini's BOM and hence, the likely price it may launch at. Now, let's take a look at how I arrived at these estimates. Memory, Camera, Wireless Section & Battery - I've assumed these components to cost the same as those in the Nexus 7. The cost of memory is likely to remain the same, as the storage capacity is rumored to be the same. The low priced option is always WiFi-only, so the wireless section would be absent, just as it is in the Nexus 7. Given Apple's penchant for quality, the camera & battery may be areas where the iPad Mini's components may cost higher, but the cost difference would probably be within 25%. User Interface, Sensors, Combo Module, Power Management, Box Contents & Manufacturing Cost - I've assumed these components to cost the same as they do in the iPad 2, as the iPad Mini is expected to have very similar specs. 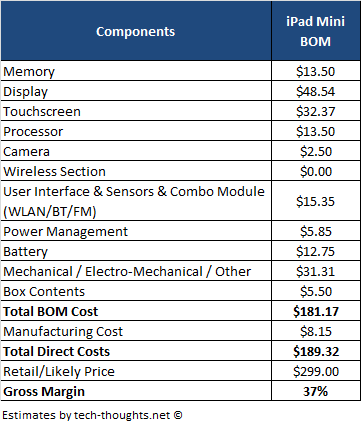 Based on previous iPad 2 BOM estimates, these components (& the manufacturing cost) do not seem to be particularly sensitive to price drops. 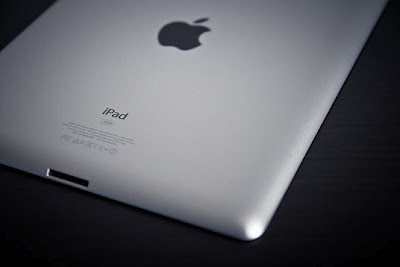 Processor - The iPad Mini will most likely use the same A5 processor found in the iPad 2 and the iPhone 4S. Based on the drop in the processor's price between the launch of the iPhone 4S and the $399 iPad 2, it should cost roughly $13.50 in Q4 2012. Display & Touchscreen - Here's where it gets interesting. The Kai design of the Tegra 3 processor, used in the Nexus 7, allowed Asus/Google to use cheaper display & touchscreen components in the device, which more than compensated for the higher cost of the processor. The iPad Mini does not have this luxury, so the display & touchscreen used here could be quite a bit more expensive. The cost of a display primarily depends on two factors, the size of the device and pixel density. The iPad Mini has a smaller display than the iPad 2, but the same screen resolution, which implies a pixel density that is nearly 25% higher. I've attempted to measure the cost impact of the screen area and pixel density by measuring the cost/sq. inch per PPI for the displays of the new iPad, iPad 2 and iPhone 4S which range from $0.007-$0.013 respectively. The cost parameter for the iPad 2 falls exactly in the mean of this range, i.e. $0.010, so this is probably a good estimate for the iPad Mini. Based on this, the display cost of the iPad Mini comes out to about $48.54. The cost of the touchscreen, however, seems to be dependent on the diagonal screen size of the device. Based on the iPad Mini's 7.85" screen (& cost estimates of the iPad & iPhone 4S), the cost of the touchscreen should be about $32. Mechanical / Electro-Mechanical / Other - I've calculated the cost of these components, based on the respective costs for the iPad 2 scaled down to the area of the iPad Mini. However, apart from the enclosure, there may be components here that do not depend on the size/area of the device. Therefore, the total cost of these components is likely to be a bit higher than my estimate. I expect these components to show the highest variation when the actual cost estimate comes out. 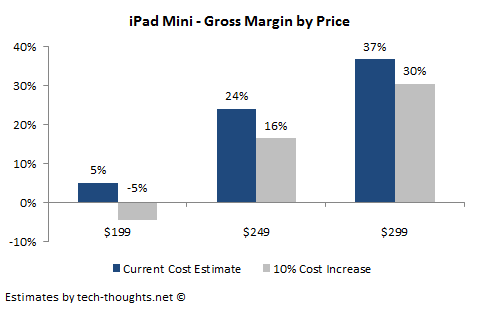 Based on the estimates above, Apple's gross margin for the iPad Mini would be between 30%-37% at a $299 price point and 16%-24% at a $249 price point. As I've stated before, any gross margin below 30% would be extremely unpalatable to Apple's shareholders, making $299 the only reasonable price. Conclusion - Taking a closer look at the iPad Mini's BOM estimate, I have to stick with my original prediction of a $299 launch price and a gross margin above 30%. It's so wonderful price estimation for iPad Mini! What about shipping, insurance, possible larger volumes than iPad 3? Marketing, distribution and overheads aren't per unit costs and are unlikely to vary wildly from those of the current iPad. Therefore, a gross margin comparison is valid. The iPad mini is going to have a manufacturing volume of 10-12 million units in q4, which is less than most estimates oh iPad sales. In any case, Apple will never be a low margin, high volume company. I'll have more clarity on this in a post sometime next month. How is possible that the Nexus 7 is sold at 199, and the galaxy note 1 at 599 ? Nexus have larger and better screen. The Tegra isn't cheap, the battery are comparable.Android is the same. The antenna ? I can't find any reason that justify 300 $. Can you ? If you have time, why not compare the Bill of material of a tablet and a phone ? No problem, you can always drop me an email as well. Aside from the fact that the wireless section (3G, etc.) is usually a substantial chunk of cost, smartphones (especially high end ones) are generally high margin products for these companies. The carrier subsidy format in developed economies usually lightens the cost to an end consumer in smartphones, but since this model is unavailable for tablets, companies need to bring down the price points to generate volumes.